Generic Remeron is an oral drug which is used in treatment of depression. There are other uses for this drug which are still considered off-label but for which you might still be prescribed this medication. These include: generalized anxiety disorder, social anxiety disorder, panic disorder, PTSD, OCD, insomnia, migraines, etc. 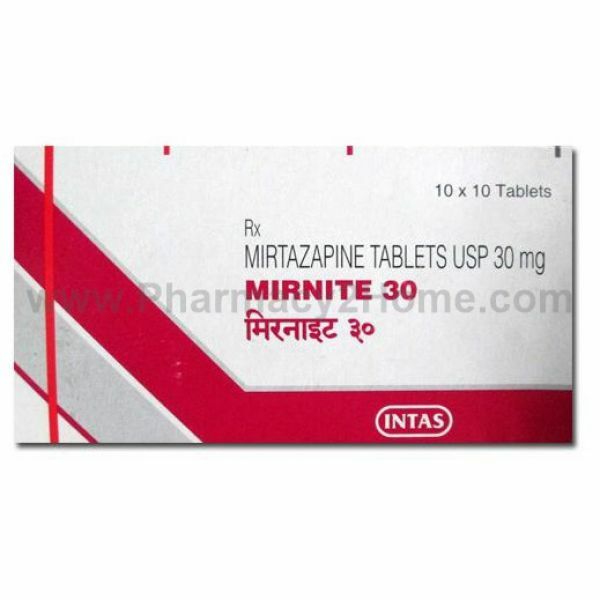 Its generic name is Mirtazapine and it is marketed under brand names Avanza, Mirtaz and Zispin, among others. Generic Remeron is classified as a noradrenergic and specific serotonergic antidepressant, or NaSSA for short. It works by correcting certain imbalances in brain chemistry and thus produces a number of effects such as anxiolytic, hypnotic, antiemetic and appetite stimulant effects. Store Generic Remeron at room temperature, away from light and moisture. It should be kept out of reach of children. Dispose of any medication that is past its expiry date and order new Generic Remeron online. Take Generic Remeron exactly as prescribed by your doctor. Do not increase or decrease your dosage on your own. If you believe you would benefit from a larger dose, tell your doctor this. Also, do not continue to use the drug if your physician has told you to stop using it. This drug is usually taken before bedtime and it should be taken with water. It may take some time before the symptoms start to subside and you experience beneficial effects. The initial dose for most conditions is 15 mg daily. However, the dosage can be increased in increments of 15 mg till the maximum dose of 45 mg daily is reached. Adhere to the dosage that your doctor prescribed . An overdose may produce these effects: drowsiness, confusion, memory problems, and fast heart rate. Seek emergency medical help if you experience an overdose on this drug. If you miss a dose, take one as soon as you remember. Do not take it if it is almost time for the next scheduled dose. Never take double doses. Generic Remeron may impair your thinking and reactions and make you feel drowsy. If this happens, do not drive or operate any heavy machinery. Avoid drinking alcohol with Generic Remeron as it may enhance the adverse effects. If you have just started taking generic mirtazapine, you may experience suicidal thoughts. Inform your doctor as soon as possible if this happens. DO not stop using the drug suddenly or without talking to your doctor. Milder Generic Remeron side effects may include: weight gain, increased appetite, drowsiness, dizziness. Serious side effects may include: headaches, memory problems, troubles concentrating, unsteadiness, weakness, white patches or sores in mouth, fainting, fever, chills, flu symptoms, very rigid muscles, sweating, confusion, fast or uneven heartbeats, tremors, overactive reflexes, hallucinations, agitation. This is a partial list of side effects. Generic Remeron is one of the most effective antidepressant medications and it is often prescribed for other mood disorders too. If you are prescribed with it, you can order Generic Remeron online. Generic Remeron should not be used if you are allergic to mirtazapine or if you are taking a drug called tryptophan. Take Generic Remeron for as long as it was prescribed to you by your doctor.